When you are pregnant, I don’t think anyone ever expects there to be a problem: you get the elusive positive pregnancy test and immediately you visualise sleepy newborns, beautiful nurseries and if you’re anything like me, you’ve already mentally test-driven several prams. No one expects, or wants to think about, an alternative scenario. Not least, when you’re expecting baby number 3. When I fell pregnant with Imogen, it was summer time, we were incredibly excited to complete our family with a third child. But having been and done it all before, we kept it secret from our families for a little longer this time, our own little secret only me and my husband knew about. It was perfect. What’s more, I wasn’t struck down with severe morning sickness like I had been in my previous pregnancies. At my scans we had a bit of a wobble when we found out the placenta was low down and covering the scar from my past c-sections, but an extra scan confirmed it had finally moved up and we were good to go for a routine, third caesarean section. I was nervous, more so than before, I knew the risks increased with each surgery you have and I had two young children already at home to think about, but I tried my best to push the negative thoughts to the back of my mind and we delivered Imogen on the 24th March 2017. The c-section was perfect, very little discomfort, excellent staff, a really lovely atmosphere in theatre and our obs were all great during our time in recovery. 12 hours later I was mobilised and we were looking good for discharge home the following day. My husband left to go home for the night and that’s when my world fell apart. Imogen, for some unknown reason, began struggling with her breathing. She was beating her arms up and down in her cot, struggling for breath. At first I rolled my eyes thinking how typical she was waking up just as Daddy had left, and then I looked in and saw her eyes rolled back and I knew we were in trouble. Despite being only 12 hours post op, I picked her up and I ran/waddled into the corridor, to be greeted by a nursery nurse who calmly took my baby off me and told me to go and sit down on my bed. I can’t even describe to you how harrowing that time was, it’s incredibly difficult to write down in words the thoughts that ran through my head in those moments. Many, many scenarios ran through my head, and none of them had a third, healthy baby in them. I shook with worry at how I was going to tell my two very excited children they weren’t going to get their baby sister they’d waited so long for. 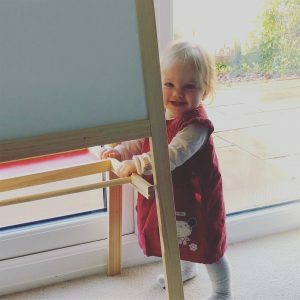 I struggled with the thought of having to go through another pregnancy to give us a third child, and then sobbed because I didn’t want another baby, I wanted Imogen, my daughter. I rang my husband and sobbed down the phone and told him he had to come back and that Imogen had been taken. Bless him, I don’t think I made much sense but he turned the car around and came right back. In the mean time, the nurse came back to find me and said the doctors wanted me to be there. For anyone who’s been in a similar situation, you’ll know how hard it is when you ask if your child is ok and no-one can give you a straight answer, “the doctors would just like you to be there,” she repeated again. Well, I’m no idiot, this didn’t sound good. We walked down the ward and found two doctors working on Imogen, an oxygen mask over her tiny little face. It turns out she’d gone a very grey colour and they had struggled for quite a long time to get her breathing. When I got there, she was breathing but her stats were taking a long time to recover. It was then that my husband came in and oh how I wept. Anyway, they got her stable and we were transferred to the neonatal unit for premature and sick babies. Neonatal is a scary place when you are unprepared for it. Heck, it’s a scary place even if you know in advance your baby will be spending time there. It’s likely that your baby will be hooked up to all sorts of wires and drips and monitors that beep almost constantly. It took quite a while to be able to drift off to sleep without hearing those beeps, they really do haunt you! 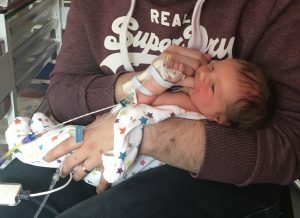 Imogen was moved to the intensive care room after she had another episode where she stopped breathing and she underwent many, many tests to try and find the cause. Many different possible causes were discussed and eventually ruled out. I remember almost wishing there to be something physical wrong, like a blockage, that they could fix with surgery and then I’d have known she was fixed and wasn’t going to suddenly stop breathing again. Nothing physical was found, the surgical team were happy, she had brain scans, x-rays, heart scans, you name it, she had it done. In the end, after many days, the consultant concluded that she just needed more time to adjust to being in the outside world, so we just had to wait it out and hope she didn’t do it again. She did. But this time she didn’t need medical intervention to sort herself out, which was progress. The neonatal ward at our local hospital has 4 different rooms, numbered 1-4. 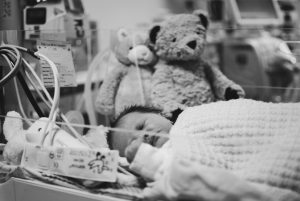 4 is intensive care, no one wants their baby to spend time there, but we did and we came out. We were moved to 2 and it seemed like such progress. You get overjoyed when they tell you you’re moving up! Eventually after a week, we spent 1 night in room 1 and then she was discharged home with nothing more than a prescription for gaviscon for her reflux! Time almost stands still in neonatal. It feels like an uphill battle to get your baby well. For every step forward, there are often two steps back. It’s a long hard slog and it’s incredibly daunting. The worry is immense and yet the sense of community is incredible. The chats you have with other parents in the feeding room, all in the same boat, all trying to express milk to feed their sick babies. When you have a set back and you can’t see yourself ever leaving neonatal, the other parents and the nurses are there for you, to mop up the tears and offer you a hug. And they rejoice with you when you get a positive result from a test or a day where things are looking up, a piece of good news. I want to remember neonatal for the people. I take my hat off to the parents who were there for months and I am in awe of the neonatal nurses and doctors who work incredibly long shifts and take the utmost care of your most precious of bundles. I am very much aware that we are incredibly lucky. The outcome could have been very, very much worse. We felt slightly infamous at the hospital and several midwives came to visit us in neonatal as they couldn’t believe what had happened: a full term baby with perfect stats needing to be resuscitated 12 hours after birth on the post natal ward (something I don’t think happens very often). Us being one of the lucky ones was almost my downfall in the coming months; I didn’t feel worthy of calling myself a NICU mum, our stay was such a short one, we bought home a healthy baby. I struggled with flashbacks to the night she was born, I just couldn’t shake them off. It would be in the moments when I was alone, when I was in the shower, when I was falling asleep at night. I found ways to deal with them, mostly blocking it out, but when we went away in the summer I felt so anxious. I was away from my familiar surroundings and it unnerved me. I wanted to wrap all the children up in cotton wool because my mind turned every situation into a worst case scenario. I found lots of blogs online talking about mums suffering with PTSD after a neonatal stay and I finally accepted what had happened was hard. It was completely reasonable to be having these thoughts and feelings, we’d come so close to loosing a child, and just because we didn’t, didn’t mean what we’d been through was any less harrowing. Our Imogen is now nearly 10months old and is just perfect in every way, she completes our family and brings us so much joy. I no longer get flashbacks and I’ve accepted that it really was a difficult time, and that’s ok. I think her birthday may be hard, but I will keep myself busy, especially at 9:30 at night!